Within the vast selection of eyeglasses to choose from, it becomes increasingly difficult to choose the right shape, colour and size to suit your face, or your lifestyle. 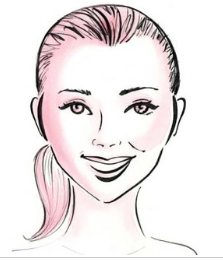 with straight sides will help to cut the curves of your face. Soften a square face with round glasses and you will see the difference. If your eyes seem too far apart, choose frames with a low thick, dark coloured bridge that covers as much skin as possible between the eyes. If you have a long and large nose, choose a frame with a low dark bridge to make your nose appear slimmer. On the other hand, a tiny nose needs frames with a high bridge. the frame, it will give a permanently surprised look. The colour of your glasses should complement your skin tone. If you have pale skin you should not wear green or yellow frames. Warm colours - pinks and browns look best. For the darker complexion, almost any colour can work. Take the colour of your eyes into account to help with the decision. The fit must be comfortable, steady and not too heavy. Anything less than an excellent fit is not only a nuisance, but will force you to frown constantly. Try on as many frames as possible before making a final decision. Look at yourself in a full-length mirror if you can, as well as a small one, to ascertain the right proportion. If you are short-sighted, the lens in your glasses will make your eyes look smaller. To compensate, use strong coloured make-up. Long-sighted people wear glasses which make their eyes look larger, so eye shadows should be more subtle.